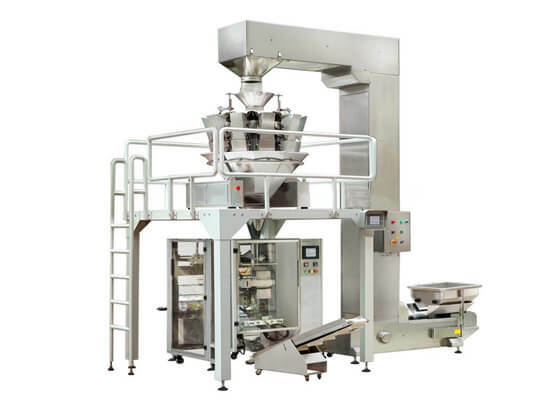 Automatic Food Packaging Equipment, A Complete Unit For Food Packing! 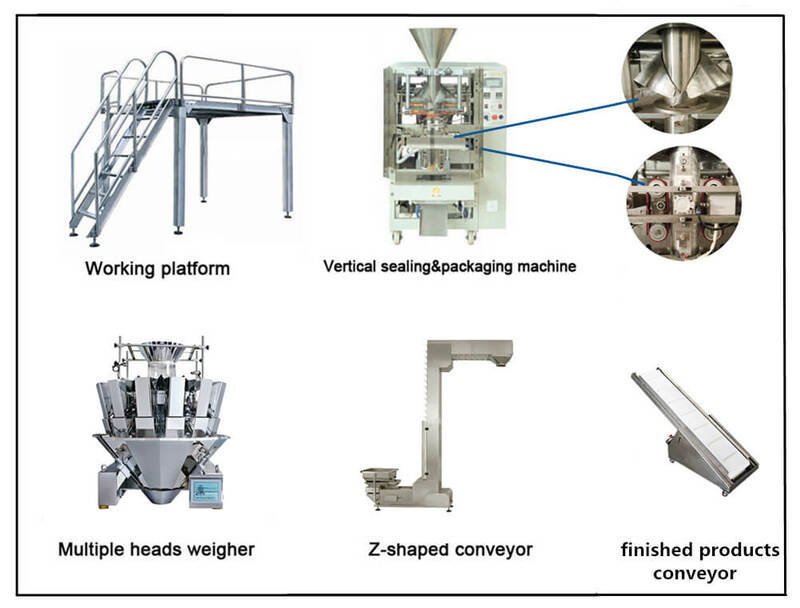 Amisy GQ-398A automatic food weighing and packaging equipment is consists of vertical automatic packing machine, ten heads combination weigher, z type elevator(with vibration feeder),supporting plate form and finished products conveyor. 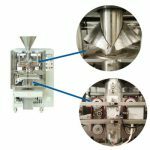 It can realize from weighing, filling to packaging automatically. 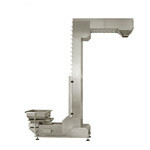 Our automatic weighing and packing machine enjoys great popularity in food processing industry. 1. It employs imported PLC computer control system, Chinese and English touch screen operating system, the working condition and operating instructions can be show clearly. 2. Using high precision servo film transporting system, transport membrane smooth, with automatic photoelectric tracking system, high positioning accuracy. 3. Intelligent digital temperature control system, temperature control stability, match with tooth profile sealing device, ensure perfect sealing. 4. Automatic fault alarm display function, such as low temperature, no packing film, no material and so on. 5. It is a fully automatic equipment can automatically complete all packaging process of measure, feeding, filling, date printing, finished product output. It is suitable to use in packing the high accuracy and easy fragile material, such as puffy food, crispy rice, candy, pistachio, apple slices, dumplings, chocolate, pet food, small hard wares, medicines, etc. 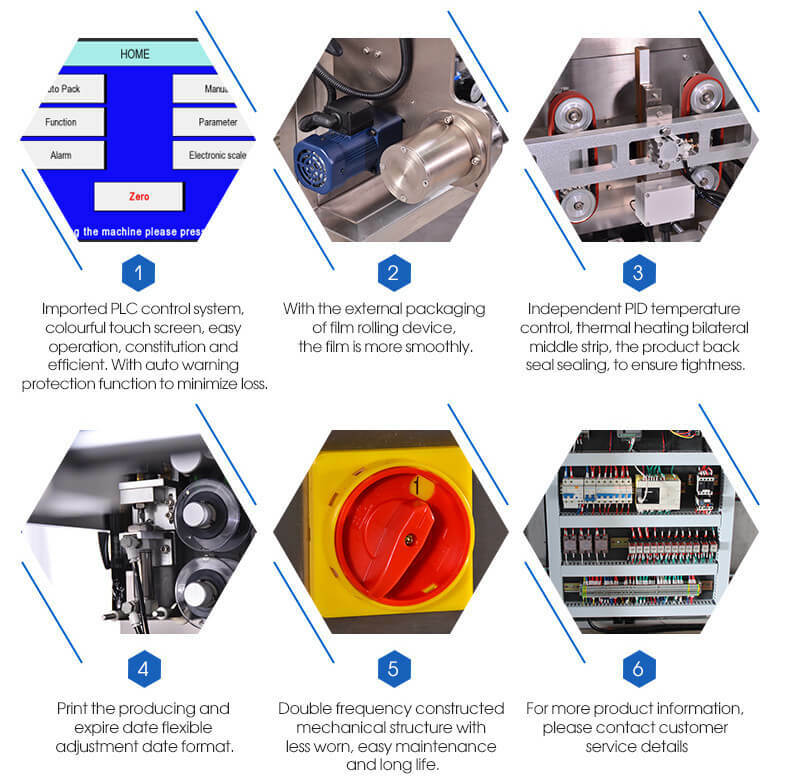 The automatic packing machine adopts PLC whole computer control system, it has many advantages such as precise positioning, low loss, nice packaging. 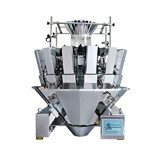 the machine can make pillow-type bag and standing bag according to customer’s requirements. It is made of stainless steel, clean and hygiene, the perfect combination of high degree and high speed, powerful data automatic statistical functions which can help you save a lot of material and labor cost, get fast investment return. The hoist driven by chain transmission lifting hopper, used for vertical transport of particles and patches of material, has the advantages of large lifting capacity, high lifting degrees. It is suitable for grains, food, feed and chemical industry. 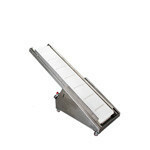 It is used to delivery packed the finished bag to the packaging test equipment or packing platform. 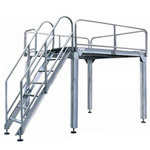 The working platform is used to support the electronic scale. 1. If you produce different products with different size bags, you should change the molding machine to meet different bag making width, for the bag making length you can adjust it by yourself. 2. Video is available, if you have any other questions please feel free to contact us.